Muji Karim didn’t want to talk to anyone, least of all a stranger. For days, he had met the unimaginable with a refusal to despair. As the extent of his injuries became clearer, though, he wondered what his life had become. The 29-year-old former football star had been trapped in a fiery car wreck in August 2011. Both legs were amputated. Much of his left hand was gone, and injuries to the right arm left him with no fully functional limb. Normally gregarious, he grew quiet. Then George Pessotti walked into his intensive-care room at Brigham and Women’s Hospital. The healthy, bald-headed volunteer more than twice Karim’s age had come to talk about recovery — physical and mental. “What does this guy know?” Karim thought. Pessotti, it turned out, knew plenty about injury, although his scars were not obvious. In 1979, then 31 and a father of two young sons, he was burned over most of his body when gas fumes ignited in his Westford kitchen. An ongoing series in which the Globe profiles those injured in the Boston Marathon explosions. Pessotti gave Karim some advice: He could choose to spend the next months worrying that he wouldn’t run or play football again, that he wouldn’t get married or have a life apart from his injuries — but if Karim thought that way, Pessotti warned, he would indeed be disabled. With Pessotti’s encouragement, Karim began attending meetings of the Phoenix Society, a burn survivor support group. He set a goal: He could have a down day, even feel sorry for himself, but not two days in a row. Pessotti became Karim’s example of life after trauma, when such a thing was hard to picture. And he inspired Karim to think about someday helping others through their bleakest moments. Karim couldn’t have known on that day in January 2012 that 15 months later bombs would explode near the finish line of the Boston Marathon, stealing the limbs of at least 16 people, many young and healthy like him, and leaving others with serious burns. He couldn’t have imagined that he would stand at their bedsides, and — tentatively at first — teach others how to survive trauma, in the process finding a new path forward for himself. One of six children raised by a single mother, Karim made his mark on the football field as a teenager at Burlington High School in Vermont and then at Worcester Academy. He and his younger brother played together for the University of New Hampshire for two years before Muji Karim graduated in 2007, just as the team was ascending from its familiar place as an underdog to become top-ranked in its division. Muji Karim met last week with Celeste Corcoran, who lost both legs in the Boston Marathon bombings. Karim was a strong safety on the field and a charmer with a wide smile off. The brothers embraced an ethic that was the team’s hallmark: to live with a chip on your shoulder, to play like you have something to prove. They were at the heart of the team, counseling younger players and hosting post-game parties. After college, with dreams of someday returning to coaching, Karim pursued work as a financial planner while living in North Andover. On Aug. 20, 2011, a Saturday night, the brothers met up with friends at a Boston bar. Their mother, Aiyana Blackhawk , was at home in Virginia recovering from back surgery, when she got a phone call early Sunday morning. The caller ID said it was her son Muji, but a police officer was on the line. There had been an accident, she recalled him saying, with fire and Jaws of Life and many first responders. “Are they alive?” she yelled into the phone. “By some miracle,” the officer replied. It’s not clear exactly what happened that night. The brothers had left their friends in Boston at about 1:30 a.m. with plans to meet up again in Medford. They didn’t arrive. Just after 4 a.m., according to police reports, the car that Karim’s brother was driving nicked the back bumper of one stopped at a light where Cambridge Street meets Soldiers Field Road in Allston, then turned east onto Storrow Drive. As the car approached the Kenmore Square off-ramp, it skidded onto a grass divider, hit a pole and then a tree, and erupted in flames. When Karim arrived at Brigham and Women’s Hospital, parts of his lower legs were burned to the bone. Word of the accident spread Sunday morning among friends and siblings. E.J. DeWitt, whose locker was next to Karim’s at UNH and who had lived with him for several years, rushed to see his friends, who were transported to separate hospitals. Brigham surgeons began the tedious work of removing dead tissue from Karim’s body. In the coming months, he would make 15 trips to the operating room, as surgeons gauged how much they could save. Every inch preserved on his legs and left hand could mean more mobility later. His left leg was amputated through the knee. Doctors removed a 4-by-8-inch section of skin and blood vessels from below his left shoulder blade and reattached it to cover exposed bone on his right leg, allowing him to keep his knee on that side. Karim battled nightmares and paranoia caused by a powerful anesthesia given during surgery. In early September 2011, as he gained clarity, medical staff gathered around his bed in the intensive care unit to explain to him what he had lost. The group waited for Karim’s despair to surface, for the anger that often explodes from people whose bodies have been so badly damaged. Karim earned a reputation for tenacity, eating more protein than doctors ordered to help his body rebuild, or doubling prescribed exercises to build his strength. Muji Karim with physical therapist Alyson Jodoin. He has been determined to keep working hard. “I can do everything about how I feel, how I react, and how hard I work to get back on my feet,” he said. He was eager to get prosthetics. He wanted his mother and brother to see him heal. And there was his daughter to consider. He kept her photo near his hospital bed. Karim had met her mother at UNH, but their relationship dissolved. His daughter turned 1 while he was at the Brigham. He hoped that, when he was well again, he could be a bigger part of her life, that she would know him as her father. For that, he needed to be ready. Doctors had said Karim might not walk for a year or more, the process complicated by the injuries to his upper body. Instead, it would be less than half that time. Karim had known his body so well before the crash, the mechanics of pressing his feet into the floor as he did squats during a workout and feeling the energy rise up his legs to lift him. Now, he had to rely on the strength of his quads and hamstrings and the sensations at the new ends of his limbs. After weeks of building core strength, it took three physical therapists to lift Karim to upright for the first time after the accident. On Jan. 20, 2012, they left him alone with his new legs. He knew he wasn’t supposed to use the prosthetics without help from a therapist. Still, Karim closed the door to his room and squeezed into them. Slowly, carefully, he took small steps toward the mirror, where he could see himself stand on his own. Two weeks later, Karim was climbing stairs in Spaulding’s therapy room. At the top, he reached out with his abbreviated left palm to fistbump physical therapist Alyson Jodoin. Beads of sweat grew at Karim’s temples as he walked the 250 feet from the therapy room to his own, one arm on a crutch and the other around Jodoin. “We could skip,” Jodoin told him, their laughter filling the tiled corridor. “I’m not ready for that one,” he said. They turned at the end to make another pass and were almost back where they had started when Karim’s left toe caught the floor. His left leg buckled and he collapsed onto his right knee, the lightness of the moment falling with him. Jodoin held him up in a bear hug, and an intern rushed over with a wheelchair. Family and friends were shuttling back and forth from his room at Spaulding to cars waiting below, carrying out posters friends had made and photos that had filled the walls. It was Feb. 17, 2012. Discharge day. With plenty of encouragement from nurses and therapists who lined the hallway to hug and kiss him, he left Spaulding Rehabilitation Hospital in February 2012 for his new life in an apartment in Quincy. Nurses and therapists lined the hallway, wearing UNH football T-shirts with the brothers’ jersey numbers. They applauded and wiped away tears as Karim walked past, arm in arm with his brother. Karim’s mother had helped him find a Quincy apartment complex with an on-site gym. She stood at the entranceway when he arrived. “Welcome home,” she said. He stepped across the threshold into the apartment where he would live alone, to know that he could do it. Spring 2012 brought stinging setbacks. A quick surgery to fix his left elbow, which froze after a fracture had gone unnoticed in the aftermath of the crash, led to infection that kept him in the hospital for 10 days. In May, he returned — another infection. There were many small victories, too. Karim progressed from walking the hallways of his apartment building to navigating the pockmarked pavement of the parking lot outside. With crutches for support, he learned the nuances of how his computer-controlled left knee responded to different surfaces and inclines. He mastered the hill between his door and the gym. Elderly neighbors paused on the sidewalk to applaud his progress. In the months before the accident, Karim had reconnected with Jenelle Aponte, a friend from high school. Afterward, Aponte had visited him often in the hospital, traveling to see him from her home in New York. By late winter, she had moved in. She made all the difference, DeWitt, the college friend, said. She made him happy. On back roads and in parking lots, Aponte would ride along while Karim practiced driving with his prosthetics. In March of this year, he passed the state test with new legs. One by one, Karim met his physical goals even as he struggled to figure out what would be next for him. On April 15, Karim, now 31, was at home with Aponte. A friend texted him to ask whether he was safe and he turned on the television to see the news: Dozens of people had been injured by explosions near the Boston Marathon finish line. 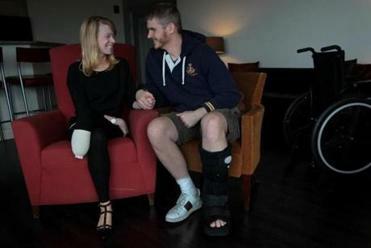 When newscasters began talking about missing limbs, he turned it off. “It hit close to home,” he said. It was something he had already begun thinking about. For months, he had been ruminating on a motto adopted from coach McDonnell: Figure it out — FIO, for short. If you have a problem, make a plan and act on it. Karim knew what Pessotti’s first bedside visit had meant to him. He had begun this year occasionally visiting patients at the Brigham and Spaulding. After the bombing, he volunteered to do for the victims what Pessotti had done for him. His first visit was early this month, to James “Bim” Costello of Malden, burned over the right side of his body from the second Marathon explosion. Pessotti went, too. As Pessotti bantered easily with Costello, Karim stood 6 feet tall and quieter than usual at the end of Costello’s bed at Spaulding, wearing a crisp purple shirt, black trousers, and loafers. The signs of his injuries were subtle: the way he shifted his weight from side to side, or swiped at the light sweat of effort on his forehead. Halfway through their meeting, Costello’s eyes lingered a moment on Karim’s prosthetic hand, thumb tucked into his pocket, as if noticing it for the first time. Costello said he was optimistic about his recovery. Buddies also injured in the blast, several of whom lost limbs, had it worse off. Pessotti invited him to a burn support group. “It definitely helps,” Karim told him, but said little else. Karim was still learning how to tell the story of his own injuries and recovery. It was not easy. With practice, he found his voice. At a meeting last week with Celeste Corcoran, who lost both legs in the Marathon bombing, Karim was far less guarded. He pulled up his pant legs to show her his amputations, and how his prosthetics worked. They joked about someday doing cartwheels together down the halls of Spaulding. Karim hopes to continue as a mentor. In June, he plans to take a peer counseling course with the Phoenix Society, to make his role with that group official. In giving, he is building his own strength. “It’s making me feel better and more at peace,” Karim said. One recent Monday morning, Karim rose before dawn. He slipped on his legs, dress pants, and a suit jacket. He drove himself to a court in New Hampshire, where three months earlier he had filed a petition for rights to see his daughter. His mother and Aponte had offered to come along. Karim declined. Without a crutch, Karim walked into the courtroom. Chelsea Conaboy can be reached at cconaboy@boston.com. Follow her on Twitter @cconaboy.